In September 2017 we took part in National Eye Health Week for Vision Matters. We are always on a mission to educate and inform our community on the importance of good, regular eye care and this was a fantastic opportunity to do just that. Eye care may be important, but unfortunately it isn’t always very exciting (to the general public at any rate!) so we wanted to do something fresh and exciting that would grab people’s attention and allow us to begin a conversation about eye health organically. As part of our Comprehensive Eye Examination, our Dispensing Optician, Steph discusses diet and lifestyle changes with our clients and recommends specific food sources, such as leafy greens, to help maintain their eye health. With this in mind we hit upon the idea of opening a pop up ‘smoothie bar’ outside the practice with a range of smoothies specifically created for their eye health boosting properties. The pop up marquee attracted a lot of attention from the public but we didn’t stop there. 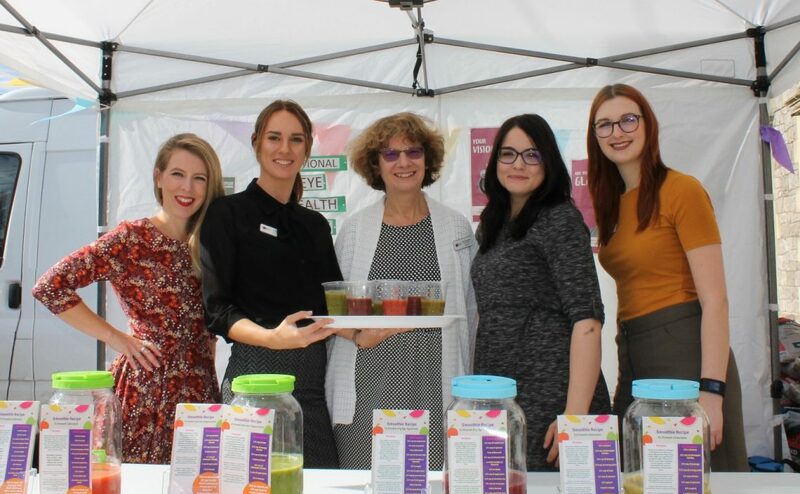 We took our smoothie shots into local businesses up and down the high street including hair salons, insurance brokers, retail outlets and even the doctors surgery. The response was fantastic and many local employees visited our stand multiple times throughout the week on their lunch breaks! The Bowen Opticians Smoothie Recipes! Our smoothie recipe cards are available to pick up from the practice or we can email them to you on request. We decorated our gazebo with bunting, fruit and colourful kitchen ware as well as laying out leaflets provided by Vision Matters and brochures of our own design. Alex, our trainee dispensing optician made healthy blueberry muffins (a big hit!) and she is pictured here with our information packs, handed out in our branded bags. Photos of all our fruit and blenders! Kate and Steph performing a taste test! To give people an idea of what it’s like to have cataracts or glaucoma, we purchased a set of simulation spectacles from Visual Impairment North East (Vine). The Vine Simulation Package is a complete “do it yourself” training pack that enables trainees to quickly understand the difficulties faced by people with sight problems and how to correctly guide them. Designed by sight loss professionals and available since 1984, it has proven to be a very economical and effective training aid for anyone working with visually impaired people. Reproduces a speck of vision in a void of darkness. An effect reminiscent of advanced Glaucoma. This goggle simulates the effect of Hazy vision with light scatter and glare. Variable visual acuity. Typical of Cataracts but also some forms of Macular Degeneration, Retinal Degeneration and other eye conditions. Reduced visual acuity leaving a level of vision of approximately 6/18 – just below driving standard. Symptomatic of the early stages of many eye conditions. The most understated of the simulation specs but perhaps the most powerful because of that. People were surprised to see how subtle the effect of reduced visual acuity was, particularly with a view to driving.